Auburn cornerback Chris Davis (11) returns a field goal attempt over 100 yards to beat Alabama during their NCAA college football game in Auburn, Ala., Saturday, Nov. 30, 2013. Auburn beat Alabama 34-28. AUBURN, Ala. - How could Auburn top its miraculous touchdown with 25 seconds remaining to defeat Georgia? With two improbable scores in the final 32 seconds to defeat Alabama. Auburn senior cornerback Chris Davis fielded a field-goal attempt by Adam Griffith, who was short from 57 yards out, and returned the ball 100 yards to catapult the No. 4 Tigers to a 34-28 victory over No. 1 Alabama in the most memorable Iron Bowl finish ever. Davis was 8 yards deep in his end zone when he fielded the kick from Griffith, a former Calhoun (Ga.) High standout, but the NCAA record book credits such returns as 100 miscellaneous yards. Regulation time appeared to have ended on a 24-yard T.J. Yeldon carry to Auburn's 39-yard line, but officials went to the replay booth and put one second back on the clock. "At first I had no idea that we would have anybody back there, then we called time out and made the switch for me to go back there and receive," Davis said. "I knew when I caught the ball that I would have room to run, and I knew we had bigger guys on the field to protect. "When I was running, I said, 'I can't believe this.' When I looked back, I said, 'God is good.'" The Tigers, who went 3-9 last season and were 10.5-point underdogs, improved to 11-1 overall and 7-1 in the SEC West, matching the records of Alabama. Because Auburn won the head-to-head meeting, the Tigers clinched the division and will play in next week's league championship. Alabama coach Nick Saban said Griffith makes kicks from 60 yards in practice and that the wind was at his back. Saban also said his team practices defending returns. "Everybody is supposed to fan the field, and we covered one side, and that's why he went to the other," Saban said. "It's the first time I've lost a game that way, and it's the first time I've seen a game lost that way." Crimson Tide tight end Brian Vogler said he had one of the better chances to stop Davis but that he took a bad angle. "We all knew they had a guy back there," Vogler said, "and we told each other to make sure we cover down after the kick. You practice it so many times, but when it happens, you're not expecting that kind of speed. He did a great job and played fast." 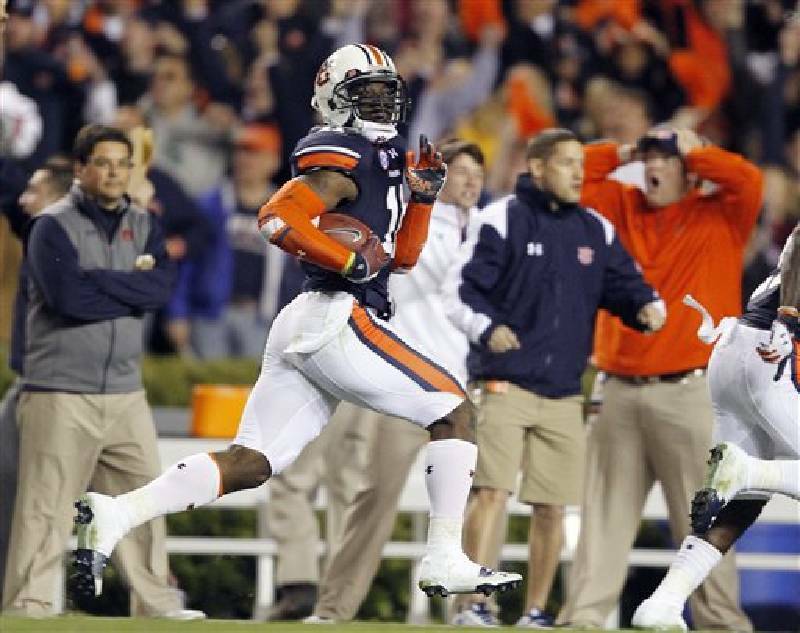 Auburn pulled into a 28-28 tie with 32 seconds left on a 39-yard touchdown pass from Nick Marshall to Sammie Coates. The Tigers were given life with 2:32 remaining, when they blocked Cade Foster's 44-yard field-goal attempt and took over at their 35-yard line. Tre Mason, who shredded Alabama for 164 yards on 29 carries, rushed six consecutive times before Marshall went around left end and then pulled up to find Coates behind Tide cornerback Cyrus Jones. "Their quarterback ran a zone pull, and we had bracket coverage on the guy," Saban said. "The safety is supposed to come out of the top on an outside release and the corner is supposed to stay with the guy, and the corner didn't stay with the guy. You've got to have tremendous discipline to play against this offense." Alabama took a 28-21 lead at the 10:28 mark of the fourth quarter on a 99-yard pass from AJ McCarron to Amari Cooper. The Tide, however, missed two field-goal attempts in the fourth quarter and lost the ball on downs at Auburn's 14 with 5:34 remaining. Yeldon, who was otherwise stout with 141 yards on 26 rushes, was stuffed for no gain on third and fourth downs. "They kept overloading one of the sides, and it just so happened they kept overloading to the side we were running to," Alabama right guard Anthony Steen said. "It always seemed like we were outnumbered. It didn't go our way, and we've got to live with it. I haven't felt this way in a long time, and I hope I don't ever feel this way again." Said Saban: "I don't ever like to say I don't have confidence in our players, but I thought the percentages were that we would make the first down. We've been a very good short-yardage team all year, but it didn't work out that way." Until Saturday, Auburn's 17-16, "Punt, Bama, Punt" victory in 1972 was considered the school's biggest upset triumph over Alabama. The Tigers rallied from a 16-3 deficit that year, scoring both of their touchdowns on blocked punts by Bill Newton that were returned by David Langner. Former Auburn athletic director David Housel believes Saturday's upset was bigger. "We weren't supposed to be bad in '72," Housel said.